Survival for Ki Lim and Sang Ly is a daily battle at Stung Meanchey, the largest municipal waste dump in all of Cambodia. They make their living scavenging recyclables from the trash. Life would be hard enough without the worry for their chronically ill child, Nisay, and the added expense of medicines that are not working. Just when things seem worst, Sang Ly learns a secret about the bad-tempered rent collector who comes demanding money--a secret that sets in motion a tide that will change the life of everyone it sweeps past. The Rent Collector is a story of hope, of one woman's journey to save her son and another woman's chance at redemption. 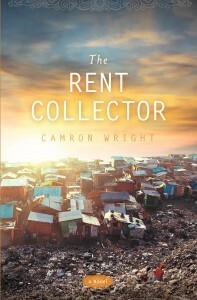 It wasn't the title - it wasn't the author...it was the cover, that drew me to "The Rent Collector," by Camron Wright. I was quickly pulled into this beautifully written story, about Sang Ly's determination to give her very ill son Nisay, a healthy place to live. Her way out would be learning to read. I loved the unexpected hero in Sopeap Sin, the rent collector - an angry drunken woman, I loved to hate...until I understood Sopeap Sin's struggle with her own demons. Without hesitation, I say, this must-read story, is filled with deep meaning.